It has not been quite a year since I participated in ORC. Late last spring, I decorated this room on a six week time table and a budget. At that time, I used some items that I had until I could acquire what I wanted. Since then, I have made a few inexpensive changes to the "master" bedroom. One of them is the perfect pillow purchase. I think I've told you that I have an obsession with pillows. I almost always have. I attribute the want to many siblings, and the fact that pillows always seemed to disappear. Today, I can never have too many pillows; so much so, that I really should close my eyes when I walk by a display. I am particularly attracted to the detail and perfection of handmade pillows. Thus, while I was recently shopping locally, I did not avoid the display, and purchased this enchanting, handmade pillow for the home. I am obsessed, and I brought this pillow home, not really knowing where it was going! My daughter spotted it as I brought it in, and after she scolded me, she said, "try it on your bed." Well she was right. And, I was right; there was a place for it, so there it stays, because it pulls the room together. It was locally handmade from vintage French cloth and a French bag. It also looks nice with the art I have in this room: western women outdoors, and you can see a partial reflection of one in the antique mirror. The cross was found years ago, and I was told it was from Ethiopia. The Madonna was a Mother's Day gift from my daughter. The curtains on the bed are from Ikea (lace) and P B (linen) and the windows are (P B). As you can see, it is a really small room. There is bureau on one side and armoire on the other, and a chest in front of the bed that can't be seen in these photos, and a chair in the corner. 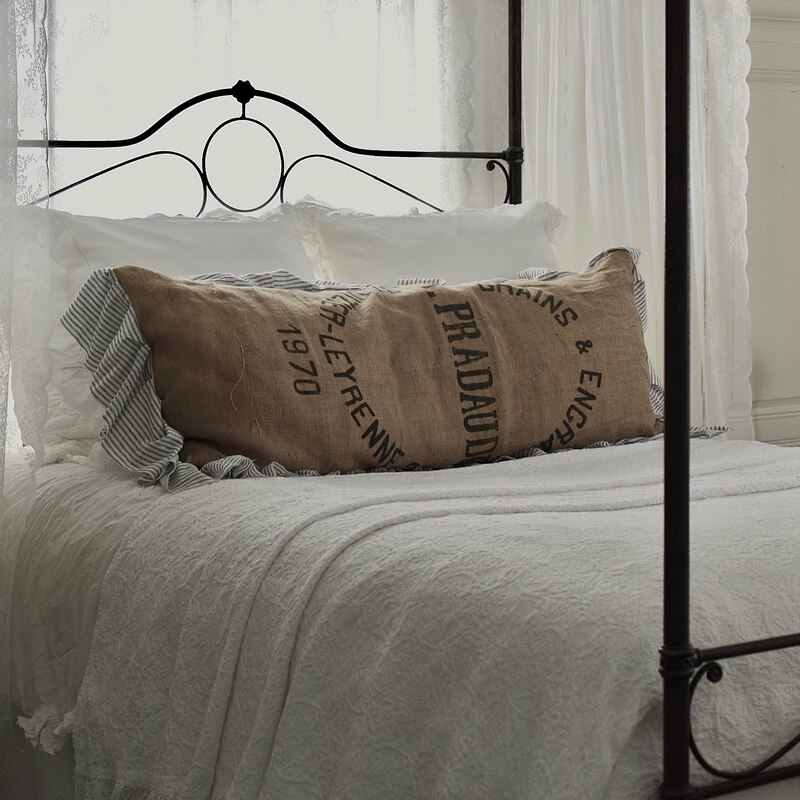 Except for the quilted linen shams from P B, the bed linens and shams were made by a Portuguese company . Madeline and Francis are in the chair in front of my daughter's portrait. soon...The Madhatter Library... Last year when I did ORC, it ended up being two rooms. I changed my library, because we switched a library piece with a bedroom piece, which required some changes as well. We went from dark to light in the bedroom and light to dark in the library. I never showed the transformation and inexpensive changes made to the library over the course of ORC. 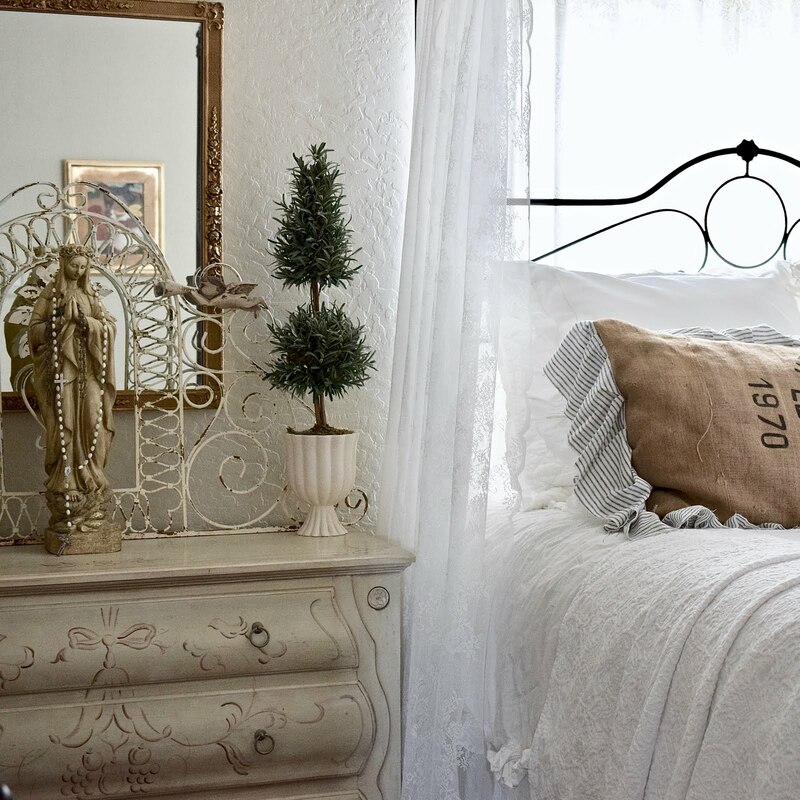 Love that pillow, so pretty and so is your master bedroom. I had missed the living room, but wow, that sofa is totally amazing. What a fabulous find. Su - Your bedroom looks fabulous! So you!! Love the big pillow. I always use one large pillow on a bed. Thanks for sharing. 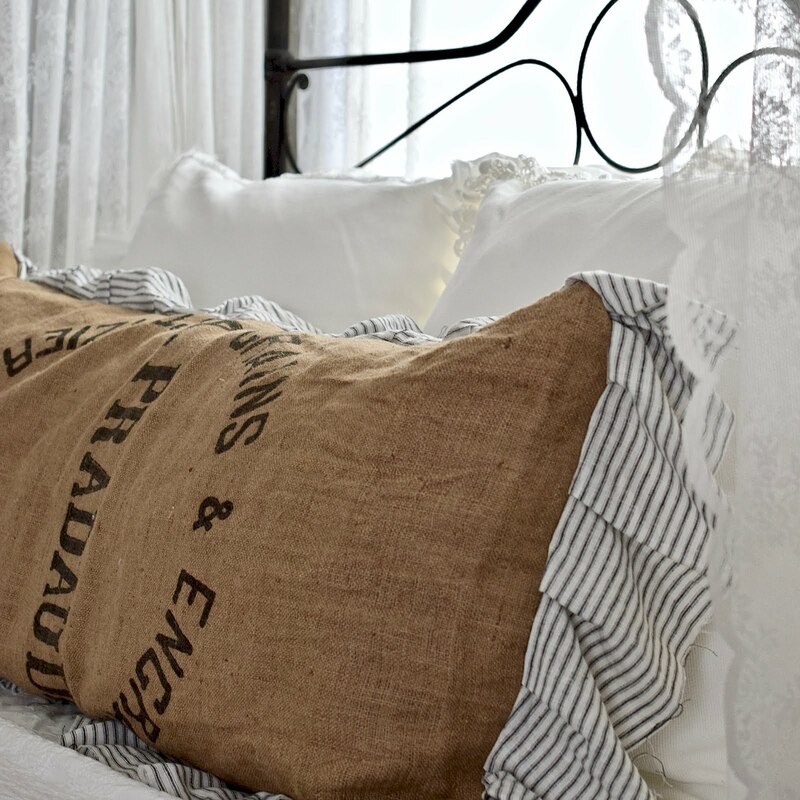 I love the pillow and the bed linens! And the dogs are so cute! Your pillow is wonderful and perfect for your style. Very pretty bedroom! The pillow adds the perfect accent. 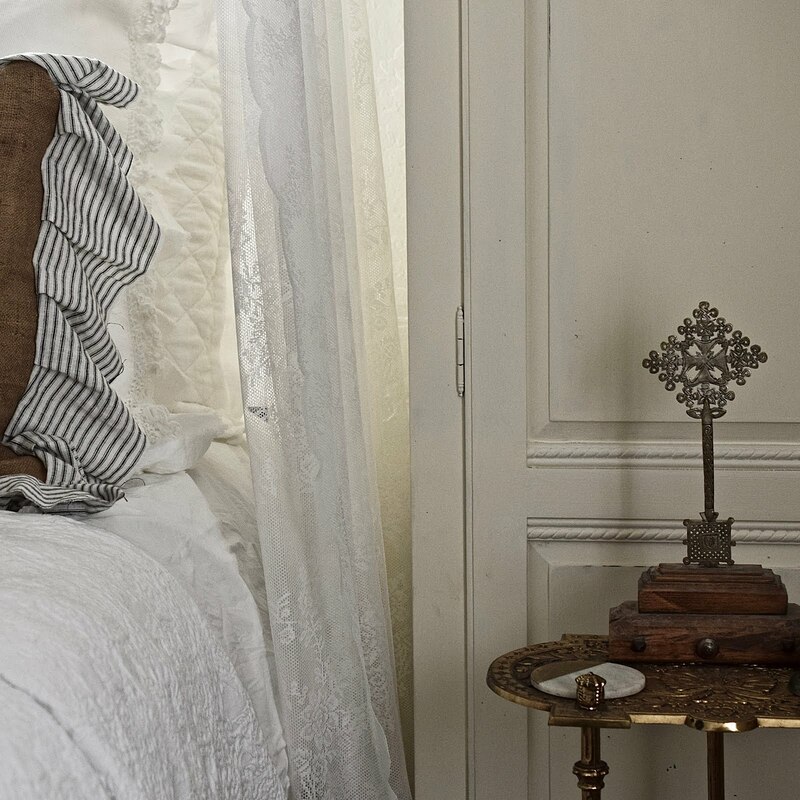 Love that big fluffy pillow with the beautiful ruffle! I know just what you mean, I come from a family of 7 kids and am the oldest sister. Such a unique pillow! I never would imagine it as a pillow! The creator of it was using a unique eye. Love the pretty pillows. Your bedroom is so serene and pretty. Happy New Week. So lovely! 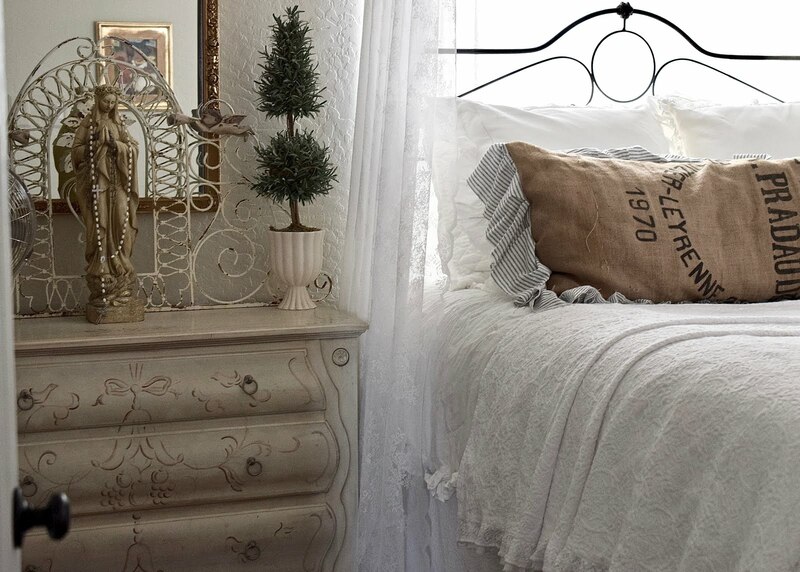 Love the addition of the pillow and all the pretties work beautifully together! So pretty and romantic. Love everything there. Hi Su, your home is beautiful and everything is always inspiring. Love the pillows and your two fur babies are adorable. Looking forward to your library reveal. You have styled your new pillow very prettily, Su. It complements your existing decor so nicely. The portrait of Madeline and Francis is SO sweet!! This room is magazine worthy. Absolutely beautiful! Wow, I love your master, and the pillow is perfect on the bed! Your cottage should be in Romantic Homes Magazine! I love it! What a lovely room and the pillow is amazing. Very, very charming. You mentioned that you might want to see my canape, well, I have just done a post on it. You are very welcome to stop by and take a peek. This is all a part of a living room redecorating project that has taken far too much time but is beginning to finally come together. Su I have the pillow ailment too... always buy them! 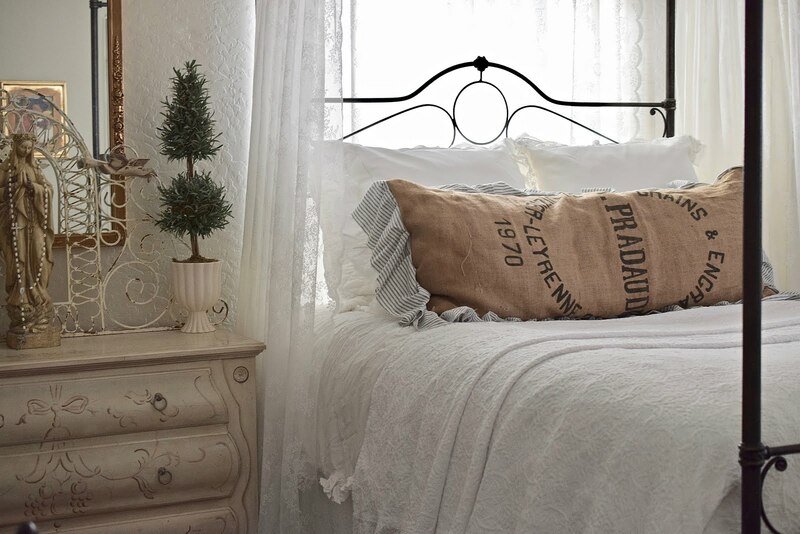 Your new addition looks fabulous on your bed! 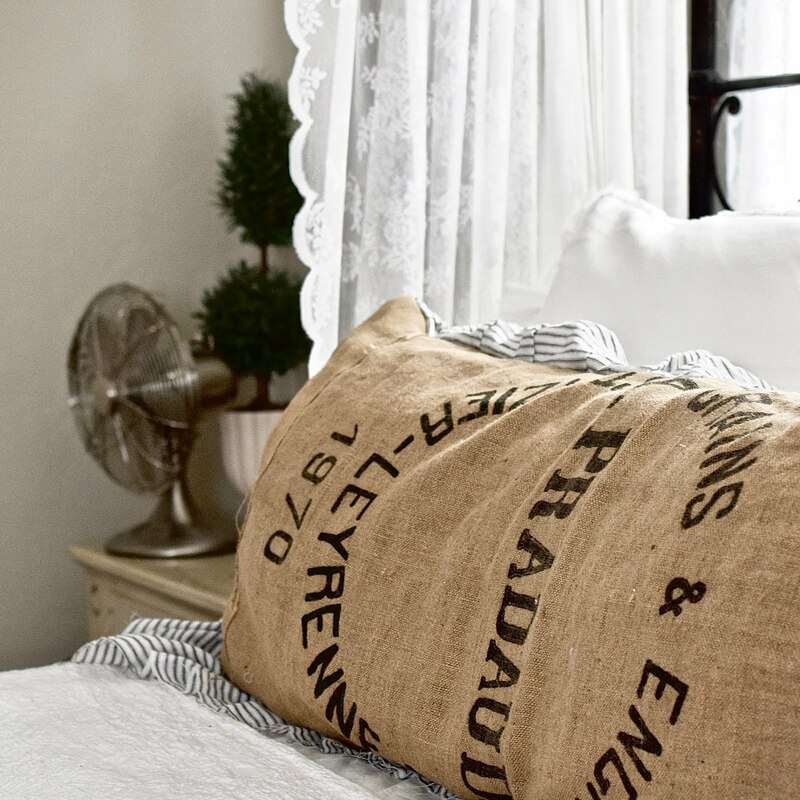 Love the French ticking and the burlap like fabric. 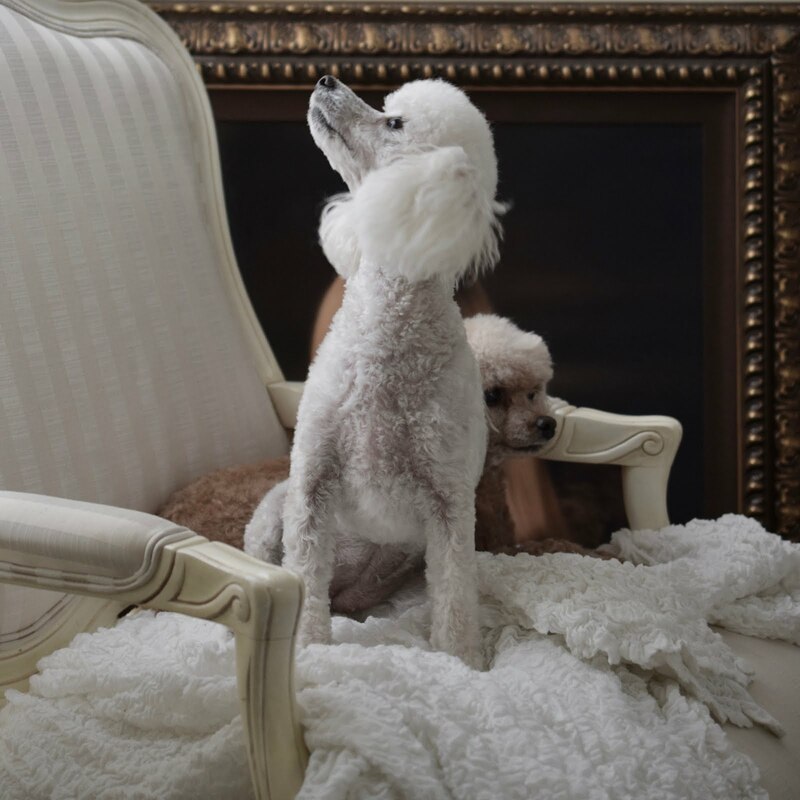 Madeline and Francis sure are poodle models, perfect pose. This is the perfect room to come to at the end of a long day. Beautifully styled, as always. I also love pillows. I love your pillow choice. It looks perfect. I always enjoy your style. Su, I love that pillow and your bedroom is gorgeous! It looks as though you have chosen each piece very carefully to make sure that each one compliments the other pieces in the room! I would not have been able to pass on this pillow either...it looks perfect! Love and hugs! This pillow is the perfect addition to your room which is very cosy but very ligth at the same point! Oh your bedroom is so beautiful - so light and bright and cozy and how I would delight in doing a running jump into that awesome pretty bed. I think my favorite, though, is your stunning Mother Mary statue - she's beautiful. Well done, looks absolutely fabulous! Beautiful room. Esp. Love the pillow on the bed. Great job. Your bedroom is just dreamy...and I am a sucker for pretty pillows, too!! I also love the statue of Mother Mary on your night stand. And we can't forget those adorable pooches. They are beautiful. Love it all.... Pillow thing over here at my home as well, I do restrain myself in that pillow section of any store. It seems I head right to the pillow bedding section. I do like making mine so I can use old fabrics, it just feels like the older fabrics anchor its space. I too have a small bedroom, yours is larger then mine, but the smaller they are the cozier they can be designed around. Can't wait to see the foot of your fabulous bed and bedroom. You have a resting place to love. Precious. Your room is gorgeous. Esse quarto está lindo, num estilo romântico e chique:) O travesseiro artesanal é encantador!